Your personal Singing Teacher that Listens to You. If I sang out of tune, would you stand up and walk out on me?Lend me your ears and ... I'll try not to sing out of key. (text from the Beatles song "With a little help from my friends"). Answer: Yes, we do! By giving you neutral feedback on pitch, rhythm and loudness. Your personal Listening Singing Teacher is always ready to give you accurate feedback. Whether you are a beginner, have already a vocal coach or follow a CD course with an e-book, audio- and video samples, Listening Singing Teacher always will assist you when you need to know what people will hear when you perform. The real time pitch and loudness tracking feedback help you to improve your performance and correct wrong tendencies by presenting you statistical data collected during the exercises. In this way you make faster progress as a beginner, and as a professional singer you can perfect your tone placement. "Colored Pitch Line" and "Repeat on Miss". Choose your Exercise, set the tempo and pitch height as you please. For a pitch exercise choose the desired feedbacks during your performance. For beginners choose to let the computer wait until you hit the note. For rhythm exercises start with a slow tempo until you master the beat. Choose to see and hear counting hints for clapping. As a beginner do not be ashamed and choose any option which helps you to reach your goals. The computer is always ready and never gets bored. Prepare: Synchronize with the beat and optionally listen to a reference note. Prepare yourself mentally to sing the starting note. Listen carefully to the Note(s). Sing the note(s). Try to imitate the heard pitch. Follow the on-screen feedback and try to correct the pitch if it is too low or too high. Clap the notes in the correct rhythm. Learn by analyzing your performance. Rehear your performance, review your pitch- and loudness-curve and compare your singing with a correct reference note played in parallel, if you desire. For rhythm exercises watch how close you can clap the rhythm. Recognize Trends. Look at the statistics for each note and see if you have a tendency to be low or high and how dispersed your pitch is. Watch your progress going from the blue level to the green, to the yellow and finally to the red level. By reaching the red level you have a solid base and the confidence that you can hit a note coming up or going down, or in the best case you can hit any note without a reference note (perfect pitch). In addition you know that you can stay on the beat! Congratulations! Listening Singing Teacher is a Home Singing course. To learn to sing you need someone who guides you. As the name implies Listening Singing Teacher does just that. The program listens to you, analyzes your performance and gives you feedback on your singing in real time. Real time means you can try to correct your singing during the singing. Below you see such an example at the end: The second syllable of o-cean starts way too low, but the singer sees this and tries to go up, finally he reaches an acceptable level: The color of the pitch line changes to green. You can also easily see how late or early you were, and how long you did sustain the correct pitch. The Red Pitch Dot in the notes gives you a hint on where your pitch should aim. During the recording you get real-time feedback. When replaying you can position the cursor to a desired point and get the same visual feedbacks like during the performance. In this way you can analyze your practice session in the actual context. You can rehear your performance as many times as you like, you can additionally overload your voice with a correct pitch, so you can analyze your performance not only visually, but also audio-wise (hear the difference). Many people give up on singing and music, because they were not ready fast enough for ear training in the school. Aural skills just take longer to learn than theory, and everyone is different. Listening Singing Teacher gives you the time to learn aural skills at the pace you need. With Listening Singing Teacher you can sing and see how you can carry a tune. The display gives you feedback on your pitch, intensity and sustained duration. It also gives you hints on how you should count rhythm. This feedback information allows you to train your “mental ear” by aiming the pitch in your head and adjusting your voice to produce the right pitch. The ability to conceptualize a pitch with your “mental” ear is the key to musical understanding. Since there is no instrument nearer to the “inner” ear than your own voice,Listening Singing Teacher uses the so-called solfege system, which consists of the syllables “Do” (Doh), “Re” (Ray), “Mi” (Mee), “Fa” (Fah), “So” (Soh), “La” (Lah), “Ti” (Tee), and “Do” (Doh) for the notes. By repeatedly using the same syllables for the same pitch, you better remember on what you have to focus to produce a specific pitch. The ability to know how to produce a pitch enhances your skill to recognize a pitch. You can of course sing the real words, or hum along the included public domain songs, however we encourage you to use solfege syllables at the beginning. By replaying the recorded exercises, you get the possibility to hear yourself and analyze your strength and weaknesses in the appropriate context. Listening Singing Teacher starts with simple scale exercises and songs, which are in C-Major. It uses fixed „Do“. Although Listening Singing Teacher is aimed at beginners, it can help advanced students by giving feedback in narrow bands, doing exercises, which give only a reference note, or do blind exercises. There is even the possibility to write your own exercises. So you can train whatever you want. However, there are limits, the smallest note is a sixteenth (in singing you rarely find notes that are shorter in duration). Triplets are only supported for eighth notes, and double sharps or double flats are not supported at all. Things, which you seldom find in modern songs. Listening Singing Teacher is not only for singers; it also helps you to get self-esteem. Self-confidence is a very important basic need in our lives, since the most impressing communication is the direct face-to-face communication. Just the knowledge, that you can hit a note, if you train yourself, can give you the confidence to speak and articulate what you want. Because you know, you can not only deliver your message, but you could even sing your matters with full impact. You do not have to be the star of the evening, but just not staying aside when others sing “Happy Birthday” makes you feel more comfortable in a group. Do your children have to pass singing tests in school? And you - as parents - are not prepared to teach them the right pitches from the wrong ones? Then this program might be worth a closer look. The program listens to your children and tells them if they are correct or too low or too high. If there are several children there is even a challenging high score table. The built in statistics can show you for each note if you have a tendency to sing the note too low or too high. The program also teaches the basic rhythm concepts. Your children can do traditional clapping exercises to train rhythms. Singing conveys better breathing. Singing activates your reward center, which influences the memorizing processes. Singing helps to reduce stress (during war or other bad situations singing helps people to go through a difficult time). It doesn't’t even matter if you sing correct or wrong, the main issue is that you sing. Of course, if you can sing in tune, so more fun you will have. We are not physicians; to confirm the above statements, consult the web or a good physician/psychiatrist (see also How singing unlocks the brain). The ability to name a note’s pitch, when you hear it. Can you distinguish two notes? Can you even say which note is higher, if the distance of the two notes is large (e. g. a low bass note and a high soprano note played on the piano)? Then you also can acquire perfect pitch. But it may be very tedious and boring, if you do it the wrong way. The grand piano spans a little more than 7 octaves. This gives you only 88 distinct keys (including semitones). That is not really much, but why is it then so difficult to learn them? Because there are so many variations, for example a C4 sounds different on a flute than on the piano. But it is still the same note. A louder played note also sounds different. The loudness attribute lets you distinguish the notes, even so the pitch is the same. If you take more characteristics it gets very difficult to remember and learn all those different variations a specific pitch can have. Those 88 different notes from the grand piano suddenly get countless. Conclusion: You have to take another approach to learn to differentiate pitch. The other approach involves your body: There is no way around your body! Since the perception is with your body and no one else’s body. And it is you that must have an internal reference to associate a pitch with a name. Beside your ears what is the next body part that comes to your mind when you hear the word pitch? Yes, it is the voice. The voice can produce different pitches. To produce a high or a low note, you must control your voice accordingly. You can’t sing? That is an easy excuse, which I do not accept. Let Listening singing teacher tell you where your pitch is. Just sing a note which you think could be for example C4. You may be way off, do not worry: Listening singing teacher shows you where you are and where C4 is. Just continue singing and try to vary your pitch. Listening singing teacher shows you immediately, if you are going in the right direction or not. You might have difficulties to hit a note in the beginning, but Listening singing teacher is very patient. It also has exercises where you must listen to sounds and then sing them back from your memory. These exercises are very good for your musical memory. Which is also a prerequisite for perfect pitch. You will see that the more you practice, your scores will increase. Finally you will get the ability to sing a scale flawlessly, just with a starting reference note. And eventually you may no more need the starting reference note. Then you have acquired Perfect Pitch. Your mind is a very effective and goal oriented machine: It will know exactly which muscles you have to relax and what tensions it has to give to other muscles to produce the desired pitch. To be able to produce a desired pitch allows you to recognize other pitches in relation with the musical memory training. In contrast to exercises where you listen to an interval and then just click the presumed heard interval-button, Listening-Singing-Teacher demands the active production of a sound. Merely clicking a button and then memorize the corresponding sound with its name is very hard, since the association for your brain is very abstract. Active singing deeply associates the produced sound with the pitch quality, since the experience for your body is “real” through the production and control of your voice. Listening Singing Teacher supports the finding of pitches which are embedded in your body. By collecting statistical pitch data for each note, you immediately see which notes have a lesser diversity than others. You also see trends in the deviation from the aspired pitch. In this way – in the beginning - you can focus on tones, which can easier be produced consistently and therefore tighten the relationship of your mental ear with your body. Finally you are able to produce a perfect pitch - out from nowhere – which you then can use as your reference pitch. Even so, the pitch for the note E4 is not in the middle in the above picture, you should take this note as a starting point, since you seem to be able to produce this pitch with you’re your mental ear and body easier than others (less diversity). In the beginning it is more important to be able to produce a consistent pitch, than a correct pitch. If you know how to produce a specific pitch, you can start singing other notes - including the correct pitch for this reference note - from “your” reference pitch. Also note that in the above sample the note E4 has more intervals (1031 respected intervals) used to calculate the mean, than the note G4 which would also be a good candidate (970 respected intervals). Try listening singing teacher, see how you can vary your pitch, and see the progress going up with each exercise session. Even so we do not give any warranties that you will have perfect pitch after buying Listening Singing Teacher, we are sure that you can profit from a singing course, to reach that goal. Listening Singing Teacher has a very simple approach: See the note on the staff - listen to the note - sing the note - get guidance where to go. For ear training the step “listen to the note” gets replaced by listen to a reference note. And the step “sing the note” gets “build an anticipated note with your inner ear and sing the note”. The feedback shows you where you went and where you should have gone. We do not sell any secrets or a super methods, but solid feedback. Try us, if the method is convenient for you, we are happy to improve your listening skills. This level corresponds to the lesson 2: You see and hear one note and you try to match its pitch. If you have difficulties to match the pitch you can choose the option that the computer should wait until you match the note. As a guidance you always see where your pitch is and where your pitch should be. This level corresponds to the lesson 3: You see and hear two notes before you start singing. This forces you to memorize the starting note and also the second note, since you have to sing them at a later time. You may think that is easy: I cheat. I remember the note. What is so difficult? Nothing. But you have to remember the second note from a longer time ago! Because you did not hear it immediately before you sing. This level you can train with the lesson 3 by choosing the option “FirstNoteOnly” from the NoteAssistance Menu. In that lesson it is of course pretty easy because by going up a scale with two notes the last note of the previous part always corresponds to the first note of the next part. Using random notes makes it a little bit more difficult, since then you really have to remember the second note or to build it from the first note with your inner ear. There is really no difference to the exercise in level 3. Except you will start to learn thinking in intervals because you do not see the second note displayed on the screen. Instead you see a question mark. Depending on the exercise, you have to sing a specified interval up or down. The advantage of thinking in intervals: There are only 12 intervals to remember. Intervals larger than an octave are called compound intervals. This exercise enforces the thinking in intervals, because you have to feel or hear the starting note relative to the ending note. Build an anticipated note with your inner ear hearing and seeing a fixed reference note for the duration of a note. This time you get a fixed reference note. So you may think: what shall I bother about that note? I sing from the heart. But the reference note played on the beginning will disturb you, because it has another pitch which is further away. But soon you will be thankful for this reference note: It gives you a handle you can count on. Your inner ear will be starting calculating the needed sound relative to the reference pitch. Build an anticipated note with your inner ear from an arbitrary note you hear and see for the duration of a note. You have to calculate the starting note in your brain fast, to be ready when the recording starts. This brain training enhances your ability to adapt to real world environments. It is a healthy mental training, which will demand some concentration on your part. You are on your own. However, since you can now hit any note from any reference note, the only thing you have to figure out is: what is my inner reference note? Listening Singing Teacher helps you by giving you statistics. Now it is time to have a closer look at the stats to find your inner reference tones. The whole scale without immediate pitch feedback shows you tendencies to drift from the target note. In the previous exercise you could still see where your pitch was, and therefore correct the note respectively the next note. In this exercise you probably recognize that some notes you hit very precisely and others you are always too low or too high. If you have one or more correct anchor points, you can start your way with relative pitch training to get the remaining notes correct. Of course you can also instruct your inner ear or voice to adjust the wrong pitches towards the correct note directly. As you can see the difficulty levels do not change much from level to level. You probably even think the next level is the same as the one you just practiced. Indeed, it is so easy. But there is one catch: You have to sing! Take the last exercise: On a piano it would be easy to spot the middle C and then play all the white keys to get a perfect performance. However, clicking some notes on an instrument does not train your ear the same way as producing them yourself. By going through the above process by singing, you will get the feeling for the music in your ears, much faster and deeper than by practicing an abstract instrument. That is because the instrument is not part of your body, but your voice is. One warning: To accomplish all 72 ear-training exercises you should have a vocal range of 3 octaves! So, if a note is too low or too high for you, do not force your voice to sing that note! Just leave it out. Do you have after these exercises absolute pitch? Unfortunately, no. But you are very close. Let us assume you are a soprano. After this method you will easily identify the notes in the soprano range, because you trained them and your inner ear. But if you hear a low bass note you wont probably be able to name the correct note, since the interval is probably two and a half octaves away from your reference ear. However you can train this too by making your own exercises. Make an exercise where the random reference note is defined to be in the bass range. So you still sing in the soprano range, you will learn the big intervals and be able to name the bass notes after a while. Of course, any kind of exercise can get quite boring, if you have to do it over and over again and do not seem to make progress. To break this situation and get new motivation, try to sing your favorite song. See how well you perform and have fun improving your pitch-hit score with one of your favorite songs. To be able to do this you have to find a MIDI-File of your favorite song. Midi stands for “Musical Instrument Digital Interface” and is a protocol to enable electronic musical instruments to play notes according to the MIDI-commands contained in a file (imagine the file as a punched ribbon which gets used in music automatons, as you can see them in museums). The advantage of having the notes digitally in a file, which adheres to a defined protocol is, that you can do all kinds of manipulation to the content. For example you can change the speed with which the notes should be played, or shift all notes up or down. Or you can even change the instrument with which a certain channel should be played, that is you can say the melody should be played on a trumpet or on a flute or whatever you like. On the Internet there are many MIDI files available, some are free others you can order. Some MIDI Files contain lyrics, these files often end with the extension .kar (for Karaoke) instead of .mid (for MIDI). If you have downloaded a MIDI file, you can import the file as an exercise. You can assign a MIDI file to any of seven available favorite lessons. Of course, you can overload them any time with another song. For the ExerciseType you can choose Pitch, Rhythm, Song or Loudness. The difference between Pitch and Song is, that a Pitch exercise changes the Lyrics to Do, Re, Mi notation. The TextStretchFactor lets you manipulate the distances between notes, so that the lyrics do not overlap from one note into the next. Some musical scores start with an upbeat (or Anacrusis). If the MIDI file does not make up for the correct upbeat, you can set the upbeat manually,. Although the program tries to find a matching melody track to the lyrics track, it might not be the correct one. In such a situation you can specify the melody track. Once you have imported the MIDI file, you can load it as any other exercise. It is advisable that at the beginning of your training session you set the speed to very slow. In this way you can easier listen and repeat the single notes. Also, if your voice range is in a different range than the one supplied with the MIDI file, use the transpose option to adjust the range to your needs. In addition you can use any other options available to normal exercises, such as "Wait till Hit", which stops the music until you hit the note before it continues, or "Repeat part on miss", which presents you the last part again if you made a mistake, so that you can train difficult parts. Relax and have fun with your favorite songs. However, we recommend that you come back to the basic exercises to master once and for all the basic musical skills. This will give you the confidence you need, to perform freely with accuracy in pitch, rhythm and loudness. Every exercise can be made a dictation exercise, by choosing the option “Blind-Exercise” and from the NoteAssistance Menu choose “WholePart”. This will play the notes, but you do not see them on the staff. You then have to repeat them from your memory. In the replay mode deactivate “Blind-Exercise” to see the notes. This is especially challenging, if you download an arbitrary MIDI File and then try to figure out the notes. By increasing the speed over the normal tempo, you get confidence that you can build some reserve for looking ahead in the score to come. Get the comfort of having time to observe your audience and interact more closely with your audience when you sing the song with the normal speed. By singing a tune in different keys (lower or higher) you get the freedom to perform in other environments where the accompaniment is tuned to a different key. As a beginner you should use all the help available. The first sing you always should do: Make the song slower, so you can easier observe what is going on..
Activate "SongPart Voice" to listen to the notes while you sing. Set the voice to sinus, so you do not get disturbed by the timbre of an instrument. In the beginning set "Wait till Hit" or "Repeat on Miss"
Before singing the lyrics sing the song with solfege notes (Do, Re, Mi, etc.). Break the exercise down into a melody part and a rhythm part. Let you help with counting hints, hear the counting hints in parallel to your singing. Rehear your performance. Optionally, hear a perfect pitched note along your voice, so you can hear the difference in addition to the visual feedback. 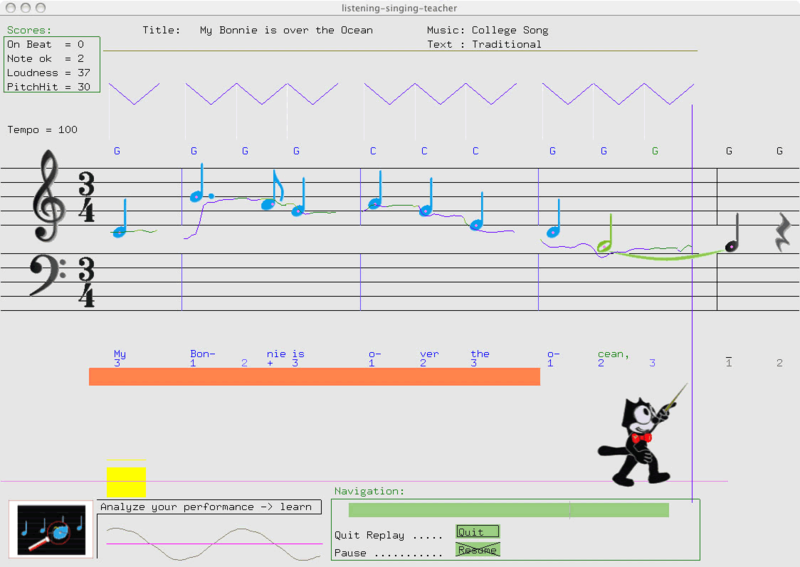 For songs you do not find in the Internet, but you have the sheet music you can either create your own abc files (see Making your own exercises), or taking a MIDI-editor and enter the notes there and then import the song or exercise as a favorite song. Find out if Listening Singing Teacher can help you making progress to sing in tune, improve your “inner” ear and your musical understanding. If you feel that this could be something for you, just try it. It is free, you only have to pay when you like it, otherwise just delete it after the trial period. Follow the instructions in the manual, how to install and use the program. The manual also has a lot of background information about music theory.. Download Manual only ListeningSingingTecher.pdf (3 MB). The only way to make progress is by practicing. However it is not difficult, since you can do the practicing, where (notebook needed) and when you want. But don’t give up, if you have to repeat a note. The only thing you have to do: is to sing. Listening Singing Teacher with its pitch recognition software acts like an external reference, which never gets bored or tired. Go slowly! Do not make sessions, which are longer than twenty minutes. It is better to do another session the next day. The next day when you start, you may find that you sing worse than the day before. This may be, because you compare yourself to the hit rate at the end of the warm up from yesterday with the beginning of the exercise today. This is OK, by the end of the warm up you may have surpassed the level from the day before. If not, do not worry, every day is different, you are in another mood, the temperature, the humidity may be different, etc. By not giving up, you will learn to handle more situations in which your body can be when singing. Even if you already have a vocational singing teacher it is a good practice to record yourself and get immediate feedback on pitch, rhythm and loudness. With Listening Singing Teacher it is like always having a teacher around when you practice. We do not have a magic secret. You have to do the work and sing into a microphone. This does not mean that it cannot be fun: you can try to sing your favorite song and see how you perform with pitch and rhythm. Unlike courses which consists of eBooks and maybe a recorder, Listening Singing Teacher is not finished when you are through reading and listening to audio samples. Listening Singing Teacher lets you download new melodies from the Internet, or make your own exercises, if you have a MIDI editing program. Listening Singing Teacher lets you not only record your voice, you can replay the recording with reference notes, or an accompaniment, to hear your performance in a context with the exact notes. The replay also shows you the pitch curve to analyze your singing. - Option Tempo: Lets you slow down any exercise or song, so that you can grab any single note. - Option Transpose: Change the melody to start on a different note (higher or lower, whatever suits you better). - Option: Repeat on Miss: Listening Singing Teacher ask you to repeat a part, if you missed some notes immediately. - Option: Wait till Hit: Can wait until you hit a note. - Gives you immediate feedback on pitch, rhythm and loudness. Randomness is not possible with audio samples and eBooks: they always sound the same. Since Listening Singing Teacher is a program it can generate new samples at random which makes it more interesting and challenging. The program evaluates your performance: It analyzes the situation and keeps statistics to give you optimal feedback. It responds to stimuli given by you. We make heavy use of the "computers brain" to give you valuable feedback and options to ease the learning process. In the application you have the possibility to pay for the program. Everybody is different, if you use more than ten hours to reach a decision if this method is useful to you, we will not go to sue you. But if you find yourself doing warm up exercises or tuning instruments with this program, after you have used it for more than ten hours, please be fair and pay for the usage. Why wait? Start today, get feedback, improve your singing and enjoy singing with confidence. Listening Singing Teacher is written in Free Pascal, and builds upon OpenGL and OpenAL. For the song writing it uses ABC-music-notation (Chris Walshaw). Midi for the accompaniments is implemented through Apple’s QuickTime. For compression zlib (Jean-loup Gailly and Mark Adler) and OggVorbis was used. The development environment is Xcode from Apple on the Macintosh side. On the windows side Lazarus (www.freepascal.org) is used. Unlike others, we do not offer a money-back guarantee. However, you do not have to pay us anything, if you feel that you did not make any progress or if you were looking for something else like for example: How to perform on stage. After downloading Listening Singing Teacher you have the right to take ten hours with the built in teacher Felix. If after ten hours you find, that you made progress and therefore you would like to continue to use the program, you have to pay for the already taken hours. Otherwise, if you think that the program was not useful for you, just delete the program and the documentation and any copies you may have made. Since you did not pay anything, you do not even have to ask for any money-back. Furthermore, if you have bought the product by a mistake (which should not be possible by agreeing to the conditions) you can return the program for a restocking fee (the cost of the financial transaction and administrative efforts). Vocal development: The program does not show you, how the lip, tongue and jaw have to be formed to get an optimal sound. We also do not give you nutrition tips. You can get that information from wiki pages and other specialized sites. It is assumed that you can speak normally and that you have the possibilities to improve yourself in this area. Breathing techniques: The documentation gives only basic tips on breathing / posture. Breath control is a very important aspect of singing. But this software cannot see or analyze your breathing. You have to do this with a mirror and the built in recording possibilities to rehear, how you sound. Chords: The voice can only sing one pitch at a time. So the method of singing arpeggiated chords (sing one note after the other instead simultaneously (harmonic chord) is explained and practiced in the interval exercise, it does not elaborate in this field. Teach you the difference between for example a G sharp and an A flat: Like the piano has only one key to represent both notes,the program will evaluate the pitch to the tempered pitch of the piano. Give hints on how to overcome stage fear or other psychological tips. You can get good information about posture, breathing, vocal techniques and singing in general on the web site of BBC (www.bbc.co.uk/sing/learning (including how to videos)). You find a lot more of tips on how to sing in the Internet. All agree that pitch and rhythm are very important aspects of singing. Some suggest having a friend with a good ear or a taking a vocal coach to help you with pitch exercises. Mainly because to be in tune and rhythm with the music is so important for the outcome of your performance, that it justifies the cost of an external guide. So why not let Listening Singing Teacher be your friend which gives you accurate feedback on your pitch and rhythm? Besides the wiki pages, we recommend the site www.vocalist.org.uk as a good resource for all kinds of information around the theme of singing. Every mother will rock her son or daughter with humming (or singing) to sleep. That is a natural instinct. Humming helps to calm down and shows presence further away from the body (you can be heard some distance from you and also in the night it marks your presence). It does not matter if the mother sings in key or not. However, it is more likely that she will sing in key than not. This lays in the nature of physics. Simple strings produce overtones, which are harmonics of their fundamental. Strings are forced by physical laws to do so. The same is true for singers: There is a natural tendency to sing in harmony. But like a child needs some time to master his voice so that everybody can understand what he wants to tell us, so does singing. The more you sing, so better you will get. This program helps you to make faster progress by giving you feedback on the three most relevant aspects of singing: pitch, rhythm and loudness. This software gives you correct feedback on a mathematical basis for pitch, rhythm and loudness. If you make all the exercises and achieve the red level (except for the “pushing the limits up and down” exercises), you have reached a very solid base. Remember: Range is not important! The exercise pushing the limits up and down are only here to stretch your range and build some reserves, so you can hit the notes (within your range) comfortably. Don't mind if you never can reach the lowest or highest note in these exercises. Few songs have a large range, the uniqueness and easiness of your voice is what counts. The program does not strive for perfection. Perfectionism is very time consuming. This website and accompanying documentation (unfortunately I must assume) has a lot of English errors, because my mother tongue is not English (but the web's is). Of course, this is no excuse. Right, but I could spend a lot of money for courses, and overseas stays and would still not reach a perfect level. Most of all, it would cost me a lot of time, which is the most precious thing we have. So I stick with my errors. But, yes, I will accept error proposals and correct the errors. As an example (and to demonstrate the philosophy behind this website) of how precious time is, let me assume you did find an error on this page. But you did not tell me about the error, because you’re busy with other things, so your time is too precious for writing a mail. Later you come back to this site and see: the error is still there. This means that other people did also think it is not so important to submit an error proposal. And that is okay. And, yes I will not accept complete rewrites in a sophisticated manner, which is no more like me. In this case I prefer to stick to my errors. But please tell me about stupid typos or other unclear sentences. I really appreciate your feedback and will do my best to correct it. That is the philosophy behind the program: Reach out for an adequate level and be happy with what you can achieve, and if you can make progress on top of this, be happy again. But stay yourself; you do not have to be the number one in the world. Use your time to fulfill your dreams your way, with your abilities. In summery the software will give you a head start by having a personal teacher that listens to you and gives you neutral feedback on your singing. To help you achieve better results faster, by practicing and giving you feedback on pitch, timing and loudness, the program analyzes your actual singing. Unlike many other singing lessons which give you only tips which you should follow and sample sounds to listen and imitate, the feedback Listening Singing Teacher gives you is very crucial, since self rehearing and self evaluation may be difficult (especially for beginners). The lessons do not strive for perfection, but by reaching the red level on the exercises you can be sure to have a solid singing base: you will hit any pitch, you have an exact rhythmic timing and you know how to accentuate notes to get more interesting songs. Of course, you can use the software to go after perfection by using the many features it has built in (e. g. making the pitch sensitivity or beat accuracy very narrow to earn points), but the main goal is to bring you to an adequate musical level.